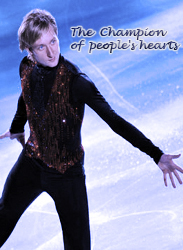 Pour la première fois à Paris, Evgeni PLUSHENKO, Champion Olympique 2006, Vice Champion Olympique 2010. Le formidable couple allemand, Aliona SAVCHENKO et Robin SZOLKOWY, Champions du Monde, médaille de bronze aux Jeux Olympiques de Vancouver. Stéphane LAMBIEL, Vice Champion Olympique à Turin, 2 fois Champion du Monde. Brian JOUBERT, Isabelle DELOBEL-Olivier SCHOENFELDER. Un spectacle original qui vous fera découvrir des numéros uniques, de voltiges, d'acrobaties et de comédies. Paris Bercy, unique gala Français du genre ! I'm late - just now I found that was tonight, French TV "Télé Ma Chaîne Sport" a direct broadcasting show in Paris "Angels on Ice"! ... but will be reprises!!! Les stars de la glace, parmi lesquelles Evgeny Plushenko, Aliona Savchenko et Robin Szolkowy, Stéphane Lambiel ou encore Brian Joubert participent à ce spectacle parisien. I cant say much now , I have to wake up cause I fly for greece, the show ANGELS ON ICE is actually KINGS ON ICE, almost same show like the other KOI,here it was Laura Lepisto as head lady, Elvis Stojko, AModio, Preubert , Ponsero, Joubert and of course headliner Plushy!!! And many mmore!!!! They did the 4 number group with Stoijko, Amodio, Jouber and Plush, PLush and Jouby have so much fun together, even off ice! Hilarious, Plushy had so big smile! Audience like this number so much!! Huge cheering. I have all videos , i ll try to uplaod them now. Tango was great and ,,,Je suis malade...I feel privileged I saw it live, my dad is sick and it brought tears in my eyes. I have no words for this program. I cant decribe now..It is Evgeni 's signature. Audience was thrilled with him and someone shout in silence Spaciba Evgeni. I havent seen him smile so much, he looked happy! And in Je suis malade he got a STANDING OVATION from all crowd!!!! I saw Yana outside , all skaters went out in the rain for autographs and I dont like autographs so I just spoke to Yana that she was waiting Evgeni, she is always so polite and nice and patient, a gazillion gilrs outside for Plushy autograph and she waited for him to finish!I told her thank you for Olympics, and her suppport, that we saw her crying in Olys and we hope she is better now, he has the people who love him, look in shows!!! I told her to come to greece for vacations and relax I told her we wanted to give him the book of wishes in Torino, she said he was training to go there , I said it is fine, his health matters most .He has done enough for the sport. Then my friend came and talked to Yana about how beautiful her hair is..girl talk Yana also remembered the bear from Tallinn!!! And then Evgeni came and he remembered me, and we talked a little, i told him congradulations for Olympics, that we cried for him and I hope he is happy now, I told him also health is important so maybe no more competitions , he doesnt need competitions and stupid "transitions", so many people come to see him in shows. So i was like, no more competitions, do shows evgeni!!! I told him he will get a gift in Buchurest from the girls and thank you for the show and that I cried in je suis malade so many emotions and because my dad is ill. No photos taken , it was raining and he was tired maybe, I didnt want to bother him and so many people were waiting for him! We kissed goodbye and we said until next time. It was also Ari and Marton there, and Plush and Yana are so cute couple by the way! It was fantastic show and the management is doing a very good work, everybody outside was talking about how well the show was organised! Ah and in next shows, someone please give evgnei some pizza, he really is too thin now! In any case he is smiley and so polite, a true King!There was also russian flags in the show, i forgot! Dimi, I hope your father will get well soon I wish all the best. OMG You spoke with Evgeni and Yana,how lucky you are ! Thank you for sharing your experiences. i hope you see it live, it is like a gift from evgeni to his fans!! And Yana and PLush are always very polite and nice, really smile people and warm hugs, so many people were waiting for autographs and he signed them all in the rain! I had a great night, the show was fantastic! And French audience loves him a lot, really nice people! The show was on tv also! Yana also remembered the bear from Tallinn!!! And then Evgeni came and he remembered me, and we talked a little, i told him congradulations for Olympics, that we cried for him and I hope he is happy now, I told him also health is important so maybe no more competitions , he doesnt need competitions and stupid "transitions", so many people come to see him in shows. So i was like, no more competitions, do shows evgeni!!! I told him he will get a gift in Buchurest from the girls and thank you for the show and that I cried in je suis malade so many emotions and because my dad is ill.
On the same music - "4 kings"? So, you kissed him ... again? people were waiting for more autographs so maybe they have a pic or something, i was with a french friend of mine. I didnt want to bother evgeni with photos, his time is enough for me that he stops to say hello. dimi wrote: ...his time is enough for me that he stops to say hello. t's interesting - how "communicate" Stojko and Plushy? Yes - Joubert missing a "golden mullet"